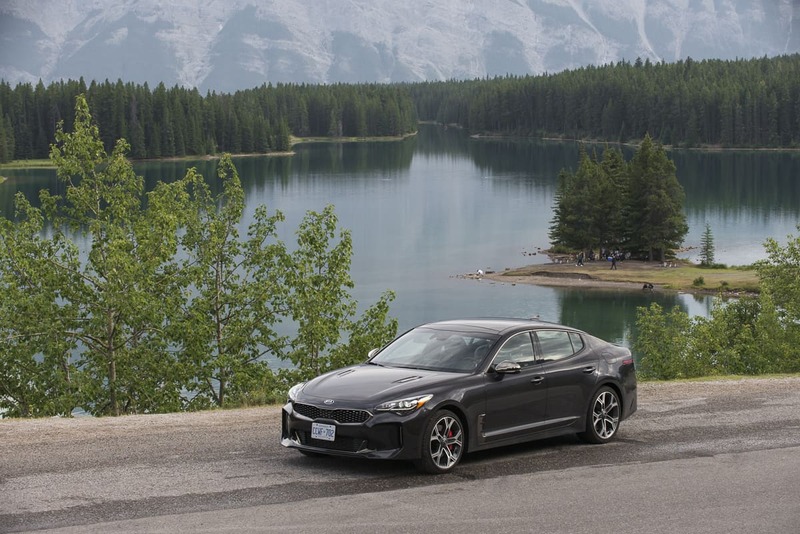 Calgary, Alberta – Few cars capture as many headlines as the Kia Stinger has done, right from the unveiling of the initial GT Concept seven years ago along with the GT4 Stinger Concept in 2014. That’s no surprise. Kia was best known for small, value-conscious family cars and SUVs yet here was a handsome, low-slung, rear-drive performance sedan from a manufacturer with no history in the sector. The 2018 Stinger went on sale across North America towards the end of 2017. Initially available in 3.3-litre, twin-turbo powered GT and GT-Limited trim, the range has now expanded to include a 2-litre GT-Line model. If that sounds a bit like the Alfa Romeo Giulia, the comparison isn’t without merit: both have looked to build interest among enthusiasts with ‘halo’ models before expanding into more affordable derivatives. We spent a week with the C$49,995 GT-Limited to see whether Kia could deliver a credible sporting alternative to its much more established – and more expensive – rivals. An uncharitable assessment of the Stinger’s styling would be to call it a squashed Optima. That would, however, do scant justice to a design that, in the metal, has considerable presence. Yes, there are some very familiar Kia design cues, notably the rear window line and C-pillar treatment. But the long hood and slightly cab-rear proportions, coupled with an overarching low-and-wide stance, set the Stinger apart from anything its maker has done before. The detailing around the lights is well executed, especially at the rear, where the wraparound LED lozenges cut a distinctive and decidedly premium profile. Having called the Stinger a sedan, it should be noted that those tail lights are in fact attached to a hatchback. It opens to reveal a reasonably sized trunk, although it does stop a little low for taller drivers, who will need to watch their heads when loading and unloading. The sporting intent of the exterior design continues in the cabin. From the moment you open the door to climb in, you know that you’re supposed to be in a performance car. For a start, it’s low, so you climb down into the car. Once seated in the comfortable Nappa leather seats, you notice that the dashboard, like the outside of the car, is low and wide. The design is simple and classic, with three large, circular vents at its heart. It’s quite a change from the touchscreen-focused designs that now proliferate and conveys the message that this car is about driving, not infotainment distractions. The overall quality of the trim and switchgear is high, if a little short of the best the luxury segment has to offer. This should come as no surprise to people familiar with Kia’s recent output. The Cadenza and flagship K900 sedans have already shown that Kia has ambitions to compete with the best when it comes to luxurious interiors. We’d dispense with the welcome ‘jingle’ as you climb in, though – we’re not sure it belongs in a luxury performance car. Passenger space is good for four adults but a fifth will be uncomfortably straddling the prominent transmission tunnel. Equipment-wise, the GT-Limited model wants for little. Head-up display, wireless phone charging and a 15-speaker Harman/Kardon sound system are all standard. There’s also a suite of advanced driver assistance systems (ADAS) including lane keep assist, a 360° camera and blind spot detection. The only option is a fancy paint colour (C$200). A 365-horsepower, twin-turbo Kia? You read that correctly. This 3.3-litre, twin-turbo powerplant is terrific, expertly walking the line between thumping performance and everyday refinement. The automated start-stop system fires more quickly than any similar system I’ve tried, so there’s no frustrating delay when pulling out of an intersection. We recorded fuel consumption of 10.1L/100km in a week of mixed driving. An 8-speed automatic transmission delivers the Stinger GT-Limited’s 376 lb-ft of torque to all four wheels. Rear-wheel drive is available in many other markets, but AWD is the only driveline option in Canada. As is the norm when shopping for Audis, BMWs and Mercedes, Canadian buyers will be glad of the peace of mind offered by AWD in poor weather. And yes, the Stinger is worthy of comparison with those luxury marques. Remember that sporting intent? It was there on the outside, it was there when we got into the car and it’s there from the moment you manoeuvre the Stinger off the driveway. On the road, you’re lower than the SUV-driving masses around you and there’s a faint rumble from the exhaust behind. The Stinger GT-Limited has power and torque to spare. The AWD, Michelin Pilot Sport 4 tires (wider at the rear than the front) and quick-shifting 8-speed do a good job of putting the power on the pavement. Acceleration from zero to 100km/h takes less than five seconds. But the Stinger is more dynamically sophisticated than the average muscle car. The steering is accurate but not pointy, and has weight but isn’t heavy. The body control is good, but there’s compliance in the ride. At speed, the subdued tire noise from the 19-inch rims puts many more comfort-oriented vehicles to shame, while there’s no wind noise to speak of. As such, the Stinger is certainly worthy of its grand touring badge. At a time when cars that provide a genuine feeling of connection with the road are thin on the ground, the Stinger GT-Limited offers a welcome consistency of sporting intent and delivers on its promise without major compromises in comfort, practicality or cost. Note that the standard Michelins are high-end performance summer tires, the likes of which are used by all the established luxury brands. We wouldn’t recommend them in a Canadian winter but again, the intent is clear. This is a bona fide sports sedan and Kia has given it the tools it needs to do the job. The same can be said of the Brembo brakes. Downsides are few, but that sleek silhouette isn’t great for visibility. The shallow rear screen gives you less of a view out of the back than you’d like, and the thick B-pillar treatment means that the rear-¾ visibility that’s crucial when changing lanes, is poor. The attentive blind-spot detection system goes some way to compensate. In 2015, Hyundai-Kia hired former BMW M engineering VP, Albert Biermann. As a statement of intent, it couldn’t be clearer. Biermann knows all about RWD/AWD performance sedans and his influence on the Stinger is clear. All cars are a team effort, however, and Kia is to be commended for arriving in an entirely new sector with such a complete product. Luxury-car regulars might find fault with some of the interior trim – and we experienced some squeaking from it when it heated up while parked in the sunshine. We were also unable to explore the limit handling and it may be that there, too, the established rivals have the edge. But any nitpicking must be weighed against the price. At $50,000, the Kia Stinger GT-Limited is a performance bargain. To equal it, you’d need to spend at least C$7,000 more on a BMW 340i xDrive sedan or C$10,000 more to snag an Audi S5 Sportback, for example, without beginning to match the Kia’s level of standard equipment. Elsewhere the Dodge Charger R/T is cheaper, but has no AWD and can’t rival the Kia’s dynamic sophistication, leaving luxury contenders as its obvious competitors. Whether the buyers shopping for traditional German, Italian or Japanese luxury can be persuaded to consider the upstart Kia, is another question. For some shoppers, badge is everything, but it’s hard to see that many of those who test drive a Stinger will be disappointed with the driving experience. At a time when cars that provide a genuine feeling of connection with the road are thin on the ground, the Stinger GT-Limited offers a welcome consistency of sporting intent and delivers on its promise without major compromises in comfort, practicality or cost. Above all, the Kia is an overdue reminder that there’s more to a sporty drive than a ‘Sport’ mode (although it has that, too).